Previously in a recent cycle, retail investors were still bearish on stocks. That has changed. The timing of these surveys is critical because retail investor optimism has exploded in the past couple weeks. Retail investors missed the rally in the first few weeks of 2019, but have since piled into stocks. That’s usually bad news for stocks. When the dumb money is fully invested, there are few bears left to convert to provide fuel for a rally. Bull markets are built on fear and skepticism. Bear markets are built on euphoria. As you can see from the chart below, the AAII investor survey shows the huge boom in allocation to stocks recently. It is almost as high as last year’s peak. 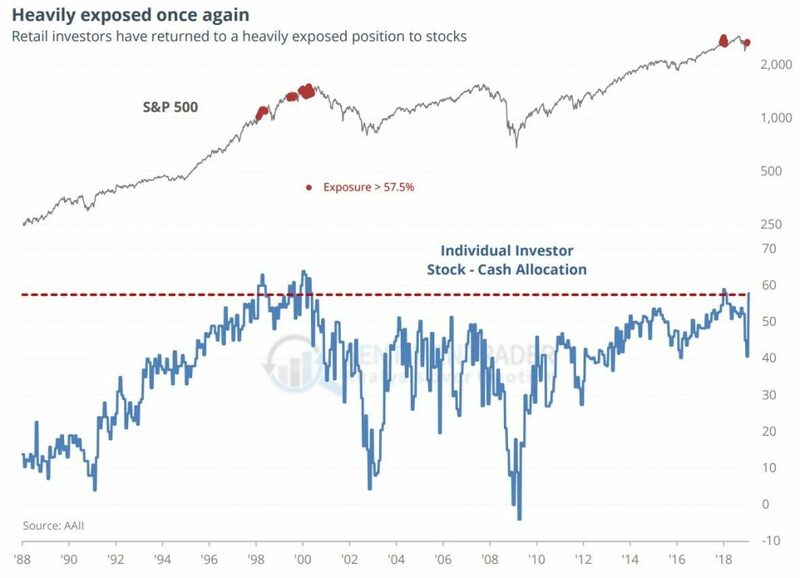 Retail investors increased their allocation to stocks to 71% and decreased their cash position to 13%. The chart shows the difference between the two. The red dots on the S&P 500 chart are when this difference has been above 57.5%. This level of exposure was breached in the late 1990s when the stock market was in a major bubble. Even though the exposure is almost the same now, I’m not expecting similar downside to the 2000-2002 bear market. Stocks aren’t as expensive. We’ve been hearing about the Chinese soft landing for years, but growth is still slowing quickly. China seems to be having a hard landing. According to the IDC, iPhone shipments in China fell 19.9% in Q4 because the phones were too expensive. While this is a problem for Apple, it’s also a major problem for China as it signals the consumer is pulling back on spending. 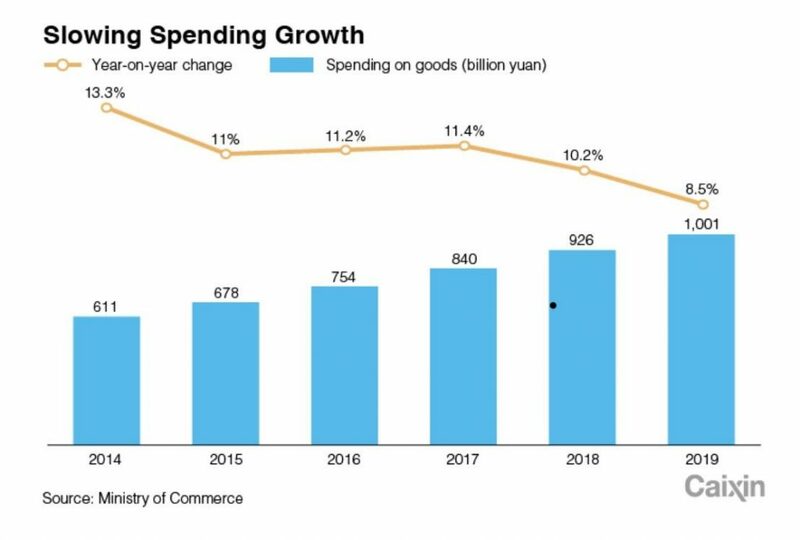 As you can see from the chart below, Chinese retail spending for the New Year holiday only grew 8.5% from the previous year. That’s down from 10.2% growth in 2018. 6% Q1 growth would be even slower than the 6.4% growth in Q4. Based on the political trends, even though real wage growth is strong, it doesn’t seem like American workers are satisfied. This bears truth in the chart below. As you can see, there were 485,000 workers affected by strikes in 2018 which is the largest number since 1986. Teacher strikes were responsible for 90% of the bump last year. They were in Arizona, Oklahoma, West Virginia, Kentucky, Colorado, North Carolina, and Washington. Some economists have blamed wage growth weakness on the demise of labor unions. It’s debatable if that’s true because wage growth has been strong recently. 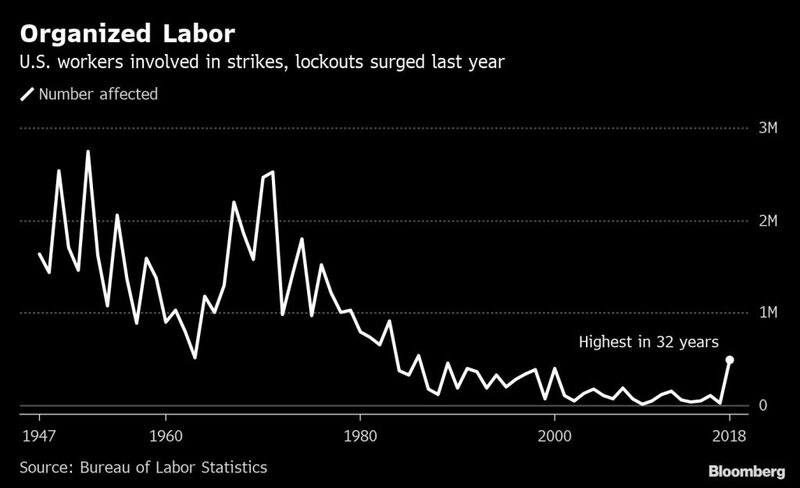 One aspect of this which is certain is that this spike in strikes doesn’t mean labor unions will be as strong as they were in the 1970s. However, unions could strengthen if the Democrats gain control of the Senate and Presidency in the next election. Stronger wage growth would lower margins. 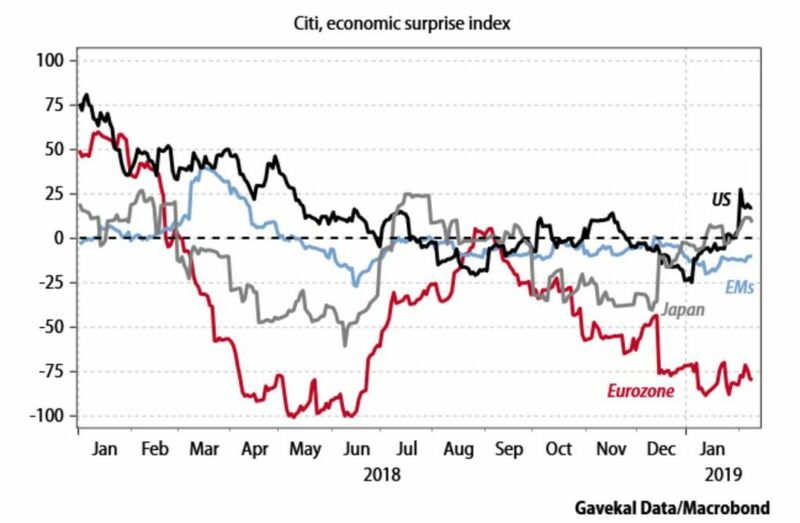 The Citi surprise index shows how economic reports are doing compared to estimates. It doesn’t show us whether growth is weakening or strengthening. This means if the index is positive, growth could be slowing, but less than expected. As you can see from the chart below, America has a positive surprise index, while Europe’s is very negative. Europe is closing in on having zero growth in 2019 as a few countries such as Italy could be in a recession. For example, in the past 12 months, the 2019 estimate for French consumption growth fell from 1.9% to 1.3%. German industrial production in December was down 3.9% year over year which missed estimates for -3.4%. Industrial production was down 1.4% in France, 5.5% in Italy, and 6.2% in Spain. France’s industrial production report was the only one that beat estimates. 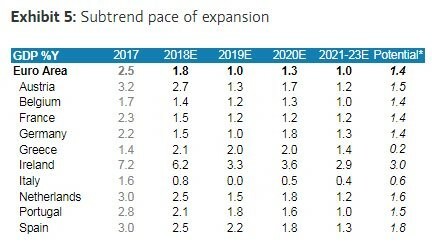 The table below shows economists expect weak 2019 GDP growth in Europe. 2019 growth of 1% would be below the potential for 1.4% growth. According to the 2019 estimates, only Greece, Spain, Portugal, and Ireland are going to grow above their potential this year. To be clear, potential growth is also an estimate. In theory, when growth is above the potential, inflation will accelerate. Since economic growth is weak and below potential, European inflation estimates as measured by the swaps market have fallen to 1.45% which is the lowest since 2016. Growth should revert to the potential like historical data reverts to its mean. Ireland is expected to have the biggest slowdown in 2019 as growth could fall from 6.2% to 3.3%. It’s not a surprise Italy is in the worst shape as it’s expected to not have any growth. It is the country most likely to be in a recession. In a previous article, I mistakenly stated that S&P 500 earnings and revenue growth estimates in Q4 and full year 2019 were higher for internationally focused firms than domestic ones. The situation is reversed. It makes much more sense this way because tech firms, which are internationally focused, have had trouble, particularly in China and Europe. Utilities is the only sector with positive Q1 earnings revisions, and this sector is domestically oriented. While the American stock market appears overbought because retail investors have gone ‘all in’, the S&P 500 could rally further. American economic reports are beating estimates while European ones are missing estimates. European GDP growth estimates have cratered. China is also slowing as its holiday retail spending growth was weak. These countries wish the biggest impediment to reaching their potential was a government shutdown as it is in America. It would make sense for the Russell 2000 to outperform the S&P 500. American growth is outperforming its peers. However, if the dovish Fed hurts the dollar, they might underperform.